This book provides an up-to-date review of research and scientific knowledge in the field of kinanthropometry. This subject area is defined as the relationship between human structure and function and is exemplified in studies of growth and development, ergonomics, nutrition, human performance and health, among other applications. This edited collection includes the latest findings in kinanthropometric research and topics include body composition, athlete morphology and performance prediction, 3-dimensional analysis, body sizing, sexual dimorphism, virtual anthropometry, somatotype, bone density, body image and anthropometric pedagogy. 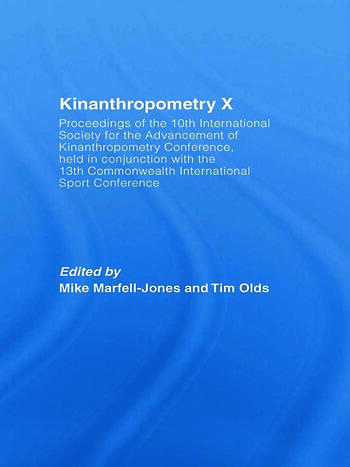 Kinanthropometry X offers essential reading for students, academics and researchers in exercise science, kinanthropometry, physical education and human sciences.